VitaOlive combines the wisdom of traditional use with modern science to bring you a vital formula for your heart, blood sugar, and immune system. Olive leaves have been used by different cultures for centuries to promote health, and modern research is confirming its health boosting power. Our olive leaf extract formula is standardized to contain a full 15% oleuropein, the natural compound in olive leaves that is the source of their health-promoting power. VitaOlive is also 100% vegetarian, GMO-free, and every batch is tested to ensure it meets FDA gluten-free requirements. Now you can easily enhance your heart and whole-body health with one convenient formula. Try VitaOlive for less than the cost of a bottle of water a day. This natural olive leaf extract can start working for you today to help maintain healthy blood pressure,blood sugar, and supporting a strong immune system. Take this opportunity NOW to discover just how amazing this unique, natural formula can help make you feel. Start giving your heart and body the support it needs. VitaOlive comes with a full 60-day satisfaction guarantee. If you aren’t thrilled with your results, we’ll give you back every penny of the product price. Don’t miss out on this opportunity. Get this right now by clicking below. 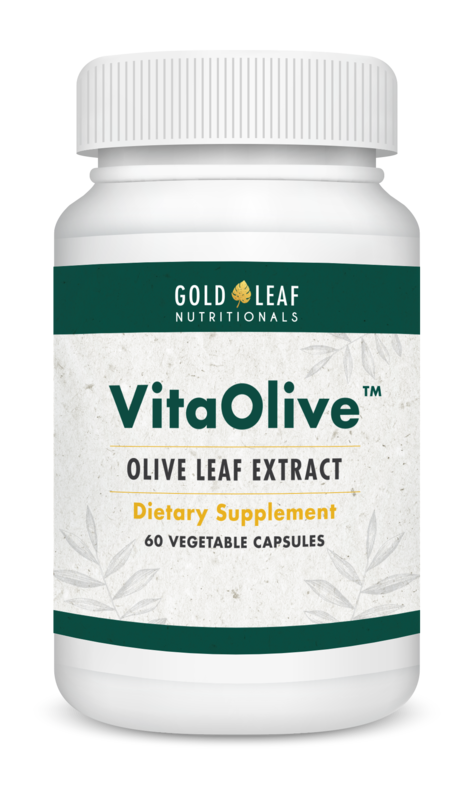 VitaOlive is a natural nutritional supplement formulated to help support a healthy heart with its active ingredient olive leaf extract. A double-blind, randomized, parallel and active-controlled human clinical study showed this ingredient helps improve healthy blood pressure, and even triglyceride levels. Another experiment out of the University of Auckland in New Zealand found olive leaf extract improved insulin sensitivity in the middle-age, overweight volunteers...without a single change in their diet or lifestyle. A 2014 study out of Murcia, Spain, shows a high-potency olive leaf extract has amazing antioxidant activity for humans and reduces oxidative stress. Stay energized and ready to take on your day! What are the quality standards Gold Leaf Nutritionals uses for their formulas, including VitaOlive? The facility we’ve partnered with has been inspected and registered as a GMP-compliant facility by the Natural Products Association, an industry organization that has even stricter standards than the FDA. Not satisfied with these certifications on their own, our Quality Assurance manager personally visited the facility, just to make sure they were everything they claimed when it came to safety and quality. She observed how the facility handles product and all workers protect themselves with lab coats and gloves. All incoming product is held in a separate, secure area to undergo inspection and quality approval before being released. Our QA manager performed an audit of their facilities, which even included the grounds surrounding the building, to make sure it was clean, and appeared pest free, and didn’t include any nearby industrial activity which could influence the laboratory’s products. She’s part of our legal compliance team, and we’ve joked she could be a lab’s “worst nightmare” because of her stringent standards and attention to detail. In her formal audit report, she was impressed with our lab and concluded they took product safety very seriously. Everything got the green light. Is there any soy or gluten in VitaOlive? Each batch of VitaOlive is tested to make sure it gluten-free according to FDA regulations. VitaOlive does not contain any soy ingredients, though it is processed in a facility that may process soy. Yes, VitaOlive is a non-GMO product. How small are the VitaOlive capsules? As you can see above, the capsules are smaller than an ordinary penny. Most find them easy to swallow. Do VitaOlive capsules have any kind of scent? VitaOlive has a faint green tea-like scent. Is VitaOlive made in the USA? The olive leaf extract is sourced from overseas, and sent to the USA to be encapsulated and packaged in a GMP-compliant facility. What are the age limits for effective usage of the product? There aren’t any age limits. However old you are, olive leaf extract could be the perfect solution for your heart concerns. But we don’t recommend any product for use by children unless directed by a doctor. How should I use this product? How many capsules a day? All you need to do is take 1 capsule twice a day, between meals on an empty stomach. If I have questions or am unsure about anything about VitaOlive, can I speak to someone on the phone? Absolutely. Immediately after joining, we will give you a special customer service number that you can call with any questions you might have. You’ll also get a special email address for the same purpose. But please note, we can’t answer give any personalized medical advice. If you have any questions about the ingredients, please look over our website which contains a wealth of information about why we chose them. If you still have questions, please contact your doctor. Our customer service is not able to provide specific advice on health. Yes, your supply of VitaOlive is 100% protected by our no questions asked anytime guarantee. You have an unlimited amount of time to try it out. If at any time you’re not thrilled with your results, we’ll refund you every penny of the product price. Is your ordering process safe and secure? It is fast, safe and 100% secure. We are using the latest complex encryption technology available to protect your data though the entire ordering process. It’s the same type of encryption technology used by giant online retailers such as Amazon.com and also utilized with most banks’ online banking technology. My blood pressure seems to be more stable. VitaOlive gives me confidence I am on the right path for better heart health. About a week after I started taking it, I noticed an increase in my positive attitude and I seem to have a little bit more energy. I knew VitaOlive was working for me when my blood pressure measured 130/79 at my last doctor's visit. Within days of trying Vitaolive my blood pressure stabilized in the 120's after several years. I've never endorsed any product, but I've recommended my physician review and try Vitaolive with his patients. About three or four days after using it I started noticing effects. My appetite is curbed and my weight is going down. Nothing else has helped my blood pressure the way VitaOlive has. Within the first week, my blood pressure improved 12 to 15 points and has remained at those levels ever since. Not only has VitaOlive given me more energy, I believe it has helped my skin look younger! I noticed feeling better within ten days of taking it. I love it! After taking VitaOlive, my blood pressure is healthy and my sleep is much better. Try VitaOlive today for less than the cost of a bottle of water a day. Its natural olive leaf extract ingredient can start working for you today to help maintain healthy blood pressure and blood sugar. Take this opportunity NOW to discover just how amazing this unique, natural formula can help make you feel. Start giving your heart the support it needs. And… if you aren’t thrilled with the changes in your body, we’ll give you back every penny of the product price.